Got a question? Ask the Eight Ball! This desk accessory is the perfect gift. 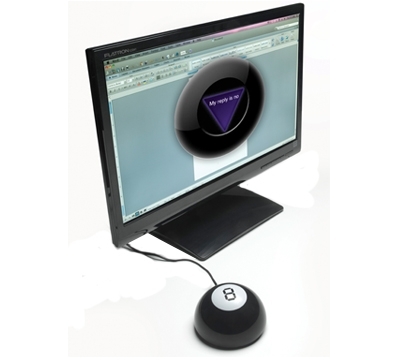 The 8 ball comes with an installation CD, works on both Mac and PC, and plugs into your USB so it’s always there when you need it. When you have a question, just tap the 8 ball and your answer will magically appear with sound effects over your open files. After 2 seconds, it disappears leaving your files intact. Can you make important decisions without it? Sure, but why would you want to?